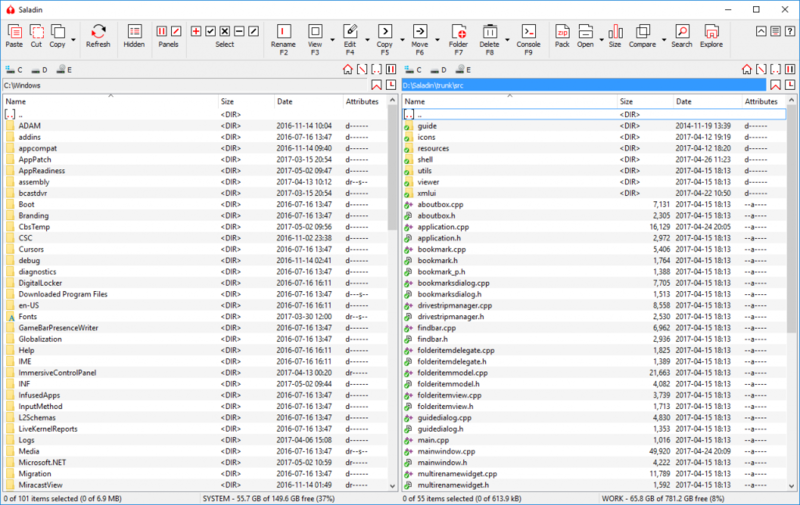 Saladin is an open source dual-pane file manager for Windows which merges the capabilities of Windows Explorer with the well known and easy to use orthodox user interface. Saladin supports both 32-bit and 64-bit versions of Windows. The Windows installers can be used to install or update Saladin. Windows 7 or newer is required. Saladin is free software licensed under the GNU GPL v3 license. Version 1.0 of Saladin is available for download. The most important and visible change is a completely redesigned, modern user interface, which includes a new toolbar layout, new icons drawn by Łukasz Grabowski, dark and white themes and a compact mode in which the toolbar is collapsed into a menu bar. Now you will have more room than ever for working with your files. Use the forums to ask questions about Saladin, report problems and suggest new features. You can also support the development of Saladin by making a donation. The Wiki contains information for developers and translators.